JOHN TERRY: As good as ever and set for a new contract. John Terry is set to be awarded another contract at beyond this season at Chelsea and it's just reward for his performances so far. In what will be his 18th season, Terry is STILL one of the best defenders in the Premier League. "He's full of confidence. I see my John of 2004, 05, 06. I don't see any difference. I only see a difference when his twins are on the training ground. They were born in that period and now they are running and kicking balls." We often hear about the likes if Costa, Fabregas, Hazard and Matic this season and rightly so. However, you ALWAYS need to be solid at the back and a tight defensive unit and without John Terry in the side, Chelsea are not the same! Terry has a wealth of experience and leads that back line better than anyone. 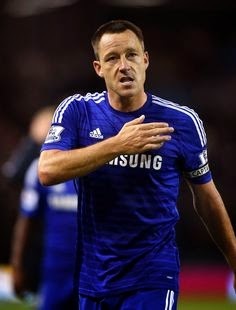 Constantly talking to players, the defenders around him and willing to give someone a bollocking if they are not doing the job they are in the team to do, Terry is our Captain, Leader and Legend. He never receives the plaudits he should for his ability with the ball at his feet and the goals he has scored over the years. Two goals in our last two games, we could do with another one today at St Mary's. A new contract is fantastic news and you have to say well deserved!